The key to everyone’s likes and dislikes in choosing and enjoying fragrances is an understanding of how the four main families have evolved. Fresh Family – From the zest of lemons, mandarins, bergamot, oranges and grapefruit come the citrus oils that lend these fragrances their distinctive tangy aroma. Floral, spicy and woody notes transformed the light, refreshing eau de cologne into real fragrances. A new generation of musk and tea accents adds an interesting dimension to the oldest fragrance family. Floral Family – Florals remain the most popular fragrance family. Their repertoire is vast, ranging from the concertos on the theme of a single floral note to mighty symphonies of heady mixed bouquets. Headspace technology has given perfumers an avalanche of exciting floral notes, it allows them to identify and clone the scent of blooms from which no oil can be extracted by traditional methods. Each year unusual new notes and molecules are found, revitalising the traditional floral theme. Oriental Family – Orientals are the exotic queens of perfumery. Sensual, often heavy, blends of oriental resins from Arabia, opulent flowers, sweet vanilla and musks are introduced by refreshing citrus, green or fruity top notes. The new ‘sheer’ Orientals gained some ground in the late 1990’s, but the appeal of the full-bodied Orientals endures. Woody Family – Lately, perfumers have rediscovered woody notes in a big way, so it makes sense to distinguish them from Chypre or Mossy Woods fragrances. Classic woody scents are dominated by harmonies of cedar, patchouli, pine, sandalwood and vetiver. A new palette of exotic wood notes, often cloned from headspace technology has stimulated greater creativity in this neglected fragrance category. 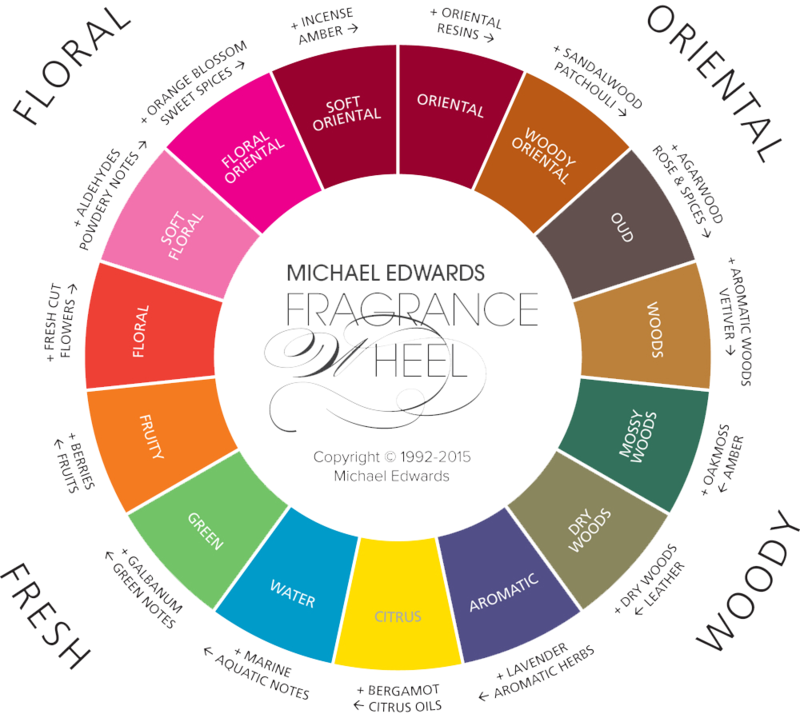 For more enlightenment see the ultimate fragrance guide published annually by Michael Edwards, "Fragrances of the World", described by all fragrance industry insiders as "The Fragrance Bible". This may be ordered online at: www.fragrancesoftheworld.com. The four main families and ten sub families are illustrated in a colour coded fragrance wheel in "Fragrances of the World" and facilitates in a unique and exclusive form the evolution and relationship of fine fragrances from 1709 until the present day. A selection of The Perfumers Guild classic and contemporary compositions have been featured in "Fragrances of the World" since artisan perfumer John Bailey founded his niche perfumery in 1981.